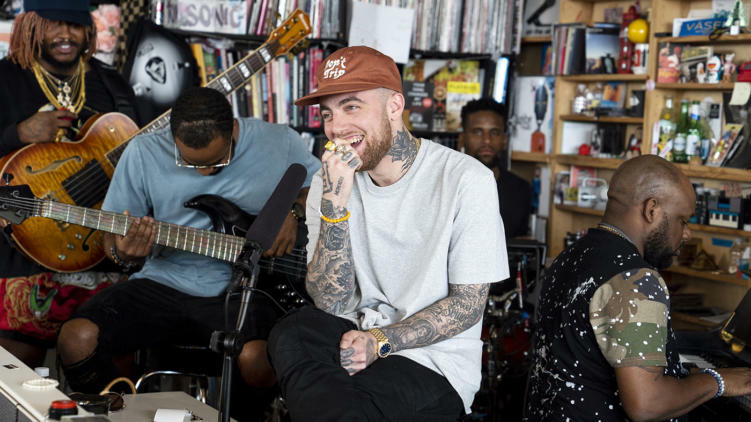 Mac Miller just released his studio album Swimming on August 3rd, and also just performed a fantastic Tiny Desk concert for NPR. The world became aware of Mac Miller in 2011 when he graced the XXL Freshman Class, which featured a special crop of MCs such as Kendrick Lamar, Meek Mill, and YG, all of whom are now considered in the upper echelon of hip-hop. Miller’s been able to find a groove and consistently release quality music, ultimately keeping his name in the conversation with the other greats. Mac Miller invited frequent collaborator Thundercat to the contest, and the duo shared music from Mac’s album. Thundercat will be joining Mac on tour this fall. There was a shift in Mac Miller’s boisterous demeanor as he started the third of his three-song Tiny Desk set. It’s the first time he’s performed tracks from his new album, Swimming, in front of an audience. On “2009,” he rubbed his chin with clinched eyes, looking like a young man who’s beginning to crack the code.